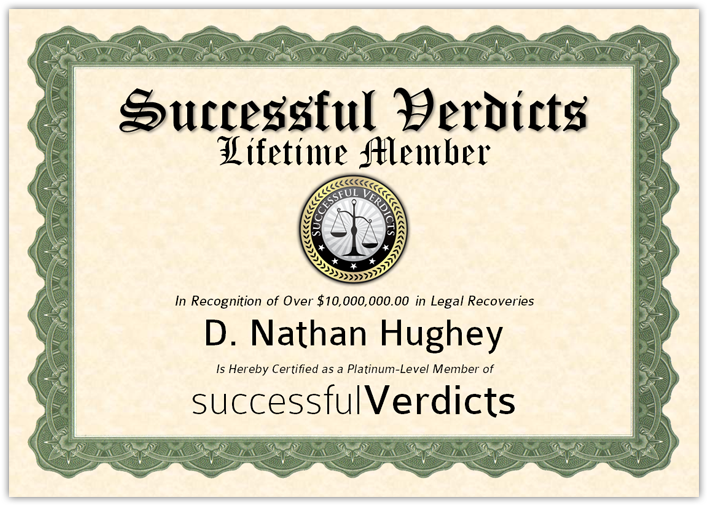 Mr. Hughey is a SuccessfulVerdicts Platinum Member & Has Successfully Recovered Over $10 Million in Compensation for his Clients. 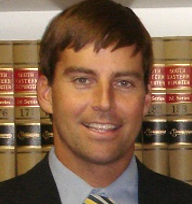 Attorney Nathan Hughey graduated from the College of Charleston in 1996. He then attended the University of South Carolina School of Law, graduating in 2000. He joined Hood Law Firm LLC of Charleston that same year, where he became a partner. Mr. Hughey then joined Lourie Law Firm LLC in 2006, where he secured numerous victories for his clients. Mr. Hughey opened Hughey Law Firm LLC in 2007 to focus his efforts on civil litigation. Mr. Hughey has handled numerous complex civil cases, including many wrongful death cases. He has handled many civil trials. He has argued before various state and federal courts in South Carolina and has argued before the South Carolina Supreme Court. Mr. Hughey was admitted to the South Carolina Bar in 2000. He was admitted to the United States District Court, District of South Carolina, in 2001. He was admitted to the United States Court of Appeals for the Fourth Circuit in 2006. Mr. Hughey has been retained to speak on topics related to nursing home and assisted living litigation as well as protecting the elderly for many years. He also teaches nursing home and assisted living litigation and regulations to other attorneys annually and has authored extensive written materials regarding nursing home litigation, and South Carolinas medical malpractice rules. Many other firms retain Mr. Hughey on a regular basis to assist them in complex civil litigation and wrongful death matters. He is a member of the American Bar Association, the South Carolina Bar, the Charleston County Bar, the American Association for Justice and the South Carolina Association for Justice. He is also a member of the Nursing Home Litigation section of the American Association for Justice. He is a former member of the South Carolina Defense Trial Attorneys Association. Mr. Hughey was born in Columbia, South Carolina and now resides in Mt. Pleasant, South Carolina. The firm serves clients throughout South Carolina. We are experienced in numerous practice areas and bring the knowledge that come with 1) handling hundreds and hundreds of civil cases, including many wrongful death and other serious civil matters and trials; 2) teaching, lecturing and writing regarding areas of law, and arguing cases before the South Carolina Court of Appeals and the South Carolina Supreme Court; and 3) working in practice areas where other attorneys routinely associate us for our experience. Since founding the Hughey Law Firm, attorney Nathan Hughey has advocated for the rights of many people who have suffered injury or death because while under the care of a nursing home, assisted living center or homecare professional. We are the law firm many legal professionals turn to when they need specific legal counsel for their nursing home injury clients. Our firm is frequently retained by other firms and often receives referrals for complex nursing home cases and in other personal injury law. Mr. Hughey has argued before the South Carolina Supreme Court, and is licensed in the United States Court of Appeals for the Fourth Circuit. Our firm has the experience to take your case from the beginning to the end. Before you take action regarding your possible claim, discuss your case with an experienced lawyer. We have helped many hundreds of clients seek the justice and compensation they deserve. We offer free initial consultations and handle personal injury claims on contingency (fees calculated before expenses). If we can't help you recover money, you won't pay attorney fees or expenses. We also offer cost-effective commercial litigation services on an hourly-fee basis and accept credit cards. We handle workers' compensation and Longshore and Harbor Workers' Act/Jones Act injury cases. Our offices in Mt. Pleasant are conveniently located just minutes from the Cooper River Bridge. We offer legal advice and representation for people throughout Charleston and all of South Carolina and are licensed in North Carolina, as well.